For anyone new to 5-axis machining, it should quickly become apparent that fixturing can be one of the single most challenging tasks that you will face during the setup process. Although there are many different styles of professionally manufactured workholding devices available, from a variety of different manufacturers - like Kurt, Raptor Workholding, Lang, Jergens, Bock, Hirschmann, and System 3R just to name a few - creativity is the name of the game. 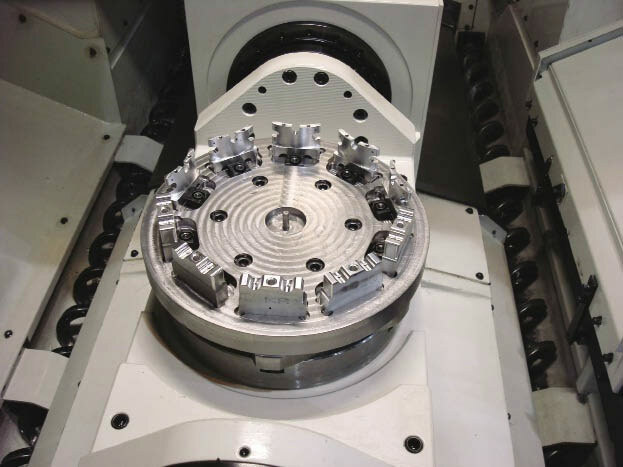 In addition to maintaining the necessary clearances around the workpiece, to eliminate the likely hood of collisions and tool interferences, selecting the best configuration for clamping and locating the workpiece can be at the heart of likely challenges you will face with 5-axis setups. Centering vises, dovetail fixtures, serrated jaws, locating pins, or specially designed fixtures are all good choices depending on the application, and each has its own individual merits and benefits. The most common seem to be a centering vise with serrated jaws for locating the part, or the dovetail fixtures that utilize a dowel pin to position the workpiece. 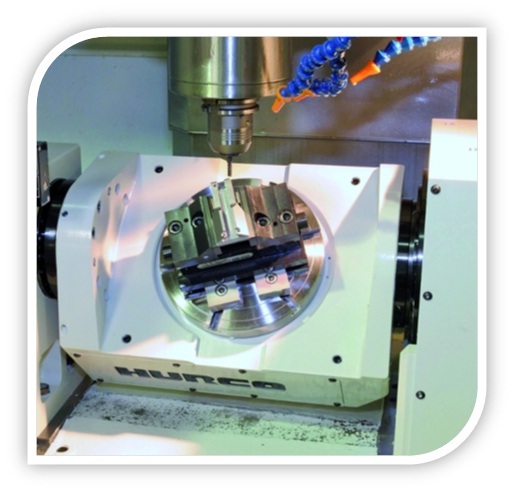 In the first scenario above - the centering vise with serrated jaws - a stand-alone hydraulic unit is used to add depressions to two sides of the workpiece. These depressions coincide with similar serrations on the vise jaws, and are used for locating the part without the need for a mechanical stop. The elimination of the mechanical stop will give full and unobstructed access to all sides of the part for machining, yet will still allow for accurate placement of the workpiece in the vise. 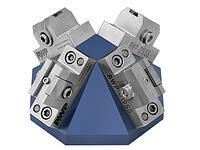 Dovetail fixtures are also a very popular means of clamping a workpiece for machining. In this method of fixturing, dovetailed angles are cut into the bottom side of the part with a special dovetail cutter. The fixture body has a matching set of angled dovetail clamping jaws that will accept the workpiece, and the clamping force is applied by means of a socket head cap screw to secure the part. 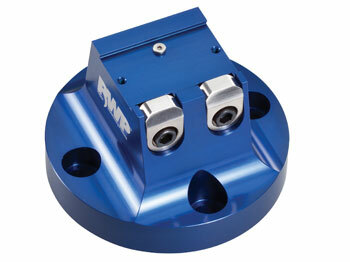 Not only is this a very effective means of holding the workpiece securely, but it also helps keep the part seated in the fixture during the machining process - and the downward force created between the mating angles of the dovetailed jaws and the workpiece prove to keep the part seated firmly in the fixture without the threat of the part lifting during cutting. 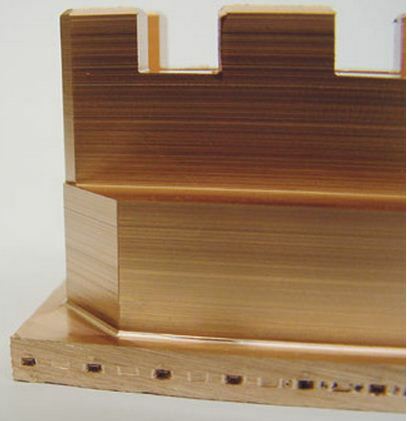 A typical means of locating the part when using a dovetail type fixture is to cut a small slot or notch in the bottom face of the part that will match up with a dowel pin permanently mounted in the top of the fixture itself. This pin is usually located in the flat area between the two jaws of the device. The dovetail jaws will act as locators for the part in one direction, and the pin will act to locate the part in the other axis direction. 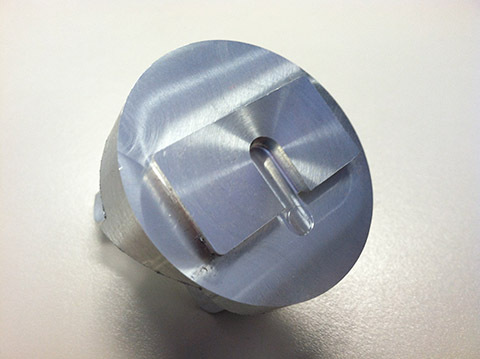 A common myth surrounding 5-axis machining is the belief that you can only fixture one part at a time. 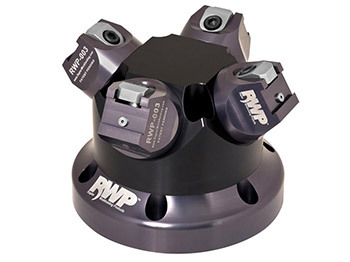 Although this is how most people envision multi-sided workholding, it is, in fact, very possible to fixture more than one part at a time with some ingenuity and proper planning. There are a number of companies who offer professionally manufactured devices for this purpose. Also, with a little bit of creativity, and with the help of some modern fixture clamping hardware, it is feasible to design and build your own DIY fixturing to achieve your goal.